Tour bus undergoing inspection by MTO officers. An enforcement blitz was underway in Ottawa today targeting one of the capital's most visible signs of summer. 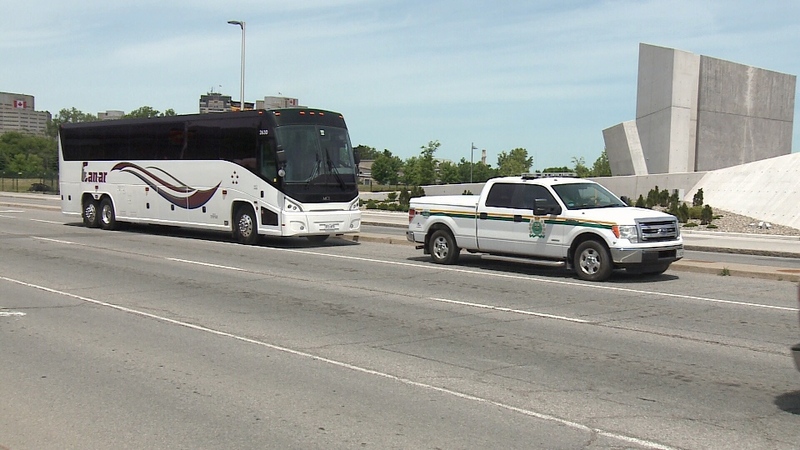 Tour buses carrying thousands to see Ottawa were searched for possible safety violations. This blitz comes less than a month since a tour bus crashed on the 401 near Prescott, killing three people. Each year, about 15-hundred tour buses roll through our city. Obviously, it's impossible to check every single bus but this random blitz is one way of ensuring those on board arrive and leave safely. It's kind of like a fishing expedition, casting about for a bite. In this case, it’s a Can-ar coach bus from the Toronto area. 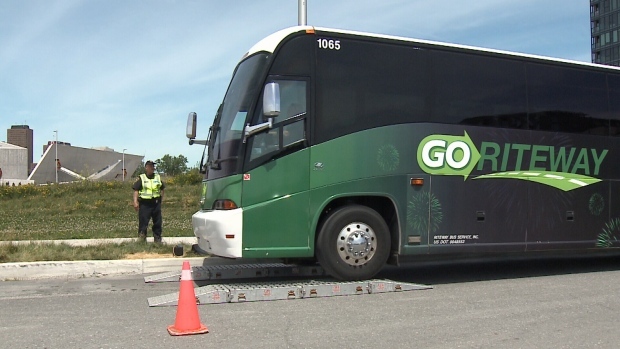 “We're doing motor coach inspections for the Ministry,” says Graeme Cook, a Transportation Enforcement Officer with the Ministry of Transportation, as he boards to bus to speak to the driver. Under the law, the drivers must comply, following the ministry enforcement officers back to an inspection site. In this case, the tour bus is put out of service, not because of defects on the bus, Cook says, but because of an issue with the class of license. “They’re just required now to get a different driver,” Cook adds. Another motor coach pulls up to the inspection site, this one from Wisconsin. It's 49 passengers are busy seeing the sites of Ottawa while the driver goes through the drill of ensuring his bus is safe on the inside, the outside and underneath. Over the course of these 2 days, MTO officers will pull over as many of the tour buses as they can to make sure they comply with all safety regulations. Just three weeks ago, a tour bus crash on the 401 near Prescott sent dozens of tourists from China to hospital. Three of them died. OPP are still investigating whether mechanical or driver error caused the crash. The Ministry of Transportation says today’s blitz isn't connected to that crash, but rather part of the process to try to make sure there isn't a similar tragedy. Krupkowski is given the all-clear to leave and heads back to the Byward Market to pick up his passengers. This is the MTO's third blitz this year in Ottawa with three more still planned during peak tourist season here. Driver of this tour bus fails inspection.